It's been a busy week—I have a house full of company and the computer seems to be in constant use by someone or another. I normally get up before the rest of the household to blog, but I've got a certain early-riser staying with me who beats me to the family room each morning to check stocks and read the online paper. He's a former Marine who taught me about "Rise and Shine" and "O'Dark-Thirty," so I don't stand a chance of waking before he does. That's my rambling way of saying, "I don't have a post today." Because I've only got about 10 minutes this morning to sit down and blog, I'm taking a page out of Conversion Diary's book. 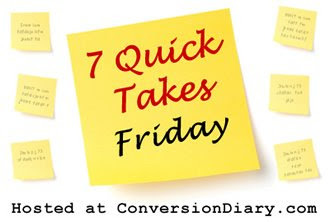 She reserves Fridays for "7 Quick Takes," a rapid jotting down of seven random thoughts without any worries about writing a coherent piece. 1. Susan Boyle. I can't believe how cynical I am, but the moment I watched this clip I figured the producers had set it up. Perhaps they are trying to recapture the lightening in a bottle that was Paul Potts. Now I don't necessarily think Miss Boyle was in on it—she seems to be an absolutely lovely, talented, authentic person who deserves every bit of adoration that she is receiving. But Simon Cowell and Piers Morgan? Big fakers. 2. I try to spare the two of you who read this blog by not writing about my fanaticism toward the TV show, Survivor. That said, I am now going to write like the fan that I am . . . I was pleased with the booting of Tyson last night. I think he was very smart and I dug the way he could deliver his hilariously sarcastic comments with such a straight face, but he was one mean dude toward Sierra. Viewers never saw her behaving in a more negative way than anyone else, but if she was as horrible as the rest of the players were saying to each other, then Tyson was a smart and powerful jerk picking on a dumb and powerless girl. Go JT and Stephen! Woot! 3. My oldest daughter is driving me cur—azy with a song/dance that she and her 5th grade friends are learning. They've compiled a various assortment of lyrics and motions from movie scenes as well as from their imaginations into a complicated routine, and my big girl practices it over and over and over and over and over and over and over. And over. In the car. At the dining table. In my bathroom when I'm trying to brush my teeth. On the sidewalk as we're walking to the library. Any where, any time, my daughter will bust a move or belt out a song. Help me, Rhonda. 4. I keep seeing and hearing on an almost daily basis a quotation attributed to Margaret Thatcher. I've seen it in the paper and on blogs, received it in emails, and heard it on the radio and in conversations. "The problem with socialism is that eventually you run out of other people's money." If I didn't know better, I'd think that the economy is on a lot of Americans' minds. 5. Scribbit posted about making her own mozarella cheese. I love sliced fresh mozarella and fresh tomatoes. LOVE it. 6. I don't have a good view of Mt. Redoubt so I haven't been able to take any decent pictures, but saddlepotatoes went up in her husband's plane and got some fabulous shots of the volcano. 7. TGIF. I no longer work outside the home, but I still find myself feeling giddy at the thought of the weekend. So much potential. You can clean out the garage in a weekend. Or put in a garden. Or lay around and read a novel. Whatever your plans are for this weekend, have a great one! Well give it a try--it's such a fun thing to do. Makes you feel so darn domestic. I want to feel domestic!!! Not just a chamber maid..hee hee. thanks for the photo nod! how fun. I got a kick out of seeing my name in lights. LOL. Now, don't get tooooo much done this weekend and make the rest of us look bad. I plan to be mostly lazy and recover from a crazy nutso week. Homemade mozzarella cheese....seriously? I can't even make a pie from scratch! But if anyone can do the homemade thing, I know it's you!! I love the weekends too. Funny thing is on Fridays I'm always so happy and joyful about the upcoming weekend but my husband looks depressed. Come Sunday evening, I'm looking depressed and he's practically jumping up and down on the sofa about "having to return to work tomorrow". It's strange, but I feel the same way about Fridays. I get all giddy, but I really shouldn't. My day is the same. Everyday. All day. The same.